Arista Kaiser was crowned Senior Ambassador of the 50th annual Tripp County 4H Rodeo which was held Friday, July 13 at the Tripp County Fairgrounds. Avery Schacht was 1st runner-up. Arista Kaiser won the horsemanship. 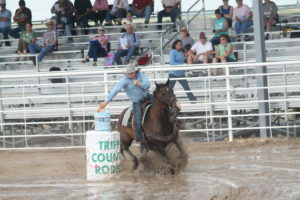 Arista will represent Tripp County at the State 4H Rodeo to be held August 17th, 18th and 19th in Ft. Pierre. Kyla Mammen was crown Junior Ambassador and also won the horsemanship. Bailey Shelbourn was 1st runner-up.